Tuberculosis is a common health problem, but tubercular myocarditis is an extremely rare condition. There are scantily described cases of the same.,, It is important to recognize this rare entity. 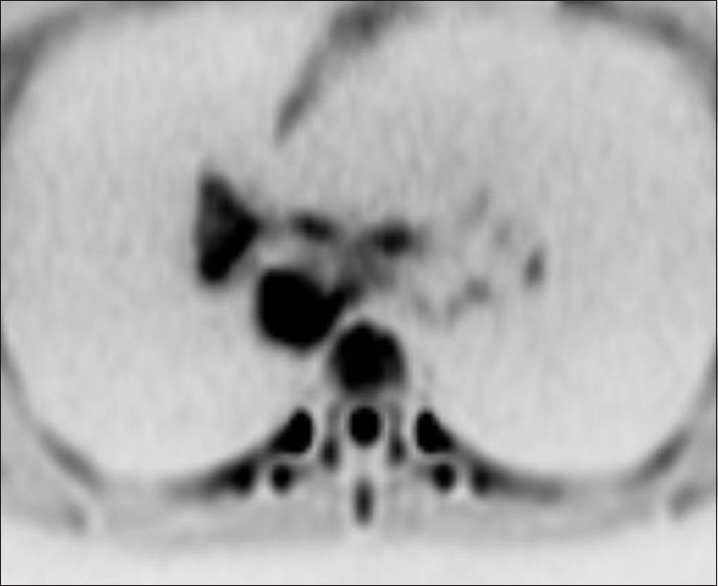 A 13-year-old male presented with complaints of sudden onset vomiting and palpitations. On examination, pulse was not palpable, and the child had hypotension (systemic blood pressure of 60/40 mmHg). There was no lymphadenopathy. Electrocardiogram showed ventricular tachycardia (VT) [Figure 1]. Cardioversion reverted the rhythm to normal sinus rhythm. Soon after cardioversion, he was asymptomatic and showed no signs of congestive heart failure, and there was no cardiac murmur. There was no history of significant preceding febrile illness, anorexia, or weight loss. There was no family history of cardiovascular diseases and sudden cardiac death. Echocardiography showed left ventricular (LV) ejection fraction of 37%, LV fractional shortening of 20%, LV dilatation with LV end-diastolic dimension of 6.7 cm, and no other structural heart disease. A 24-h Holter monitoring showed ventricular ectopic activity, and the fastest ventricular run consisted of 12 beats with maximum heart rate of 154 and minimum of 82/min. The blood investigations showed hemoglobin: 14.2 g/dl, total leukocyte count: 5100/cubic mm, and creatinine: 0.9 mg/dl, erythrocyte sedimentation rate was high – 37 mm/1st h, and troponin was raised with levels of 149. There was significant mediastinal widening on chest X-ray. Mantoux test was positive with reading of 20 mm after 48 h. Quantiferon gold test for tuberculosis was also positive. Serum angiotensin-converting enzyme levels were mildly raised 89 u/l (normal range: 8–52 u/l). 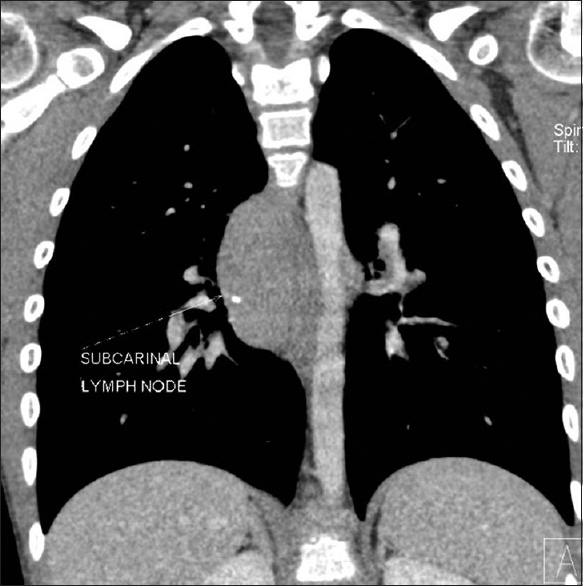 Computerized tomography (CT) chest showed extensive confluent mediastinal and right hilar lymphadenopathy with focal calcification in subcarinal lymph node [Figure 2]. CT coronary angiography showed normal coronaries. Magnetic resonance imaging (MRI) was done which showed mediastinal lymphadenopathy [Figure 3], diffuse LV dilatation, with myocardial edema, subendocardial septal and lateral wall scarring, and punctate mid-wall-enhancing granulomas [Figure 4] consistent with acute myocarditis, with granulomatous cardiomyopathy. Physical examination revealed that there were no palpable cervical, supraclavicular, axillary, or inguinal lymph nodes available for excision or biopsy. Bronchoscopic lymph node biopsy was suggestive of a chronic granulomatous lesion. Bronchoalveolar lavage was negative for acid-fast bacilli. A standard antitubercular regimen was commenced, comprising rifampicin (120 mg), isoniazid (50 mg), pyrazinamide (300 mg), ethambutol (1 g), and pyridoxine (10 mg; all taken once daily) with steroids and amiodarone, which was gradually tapered with completion of antiarrhythmic therapy. 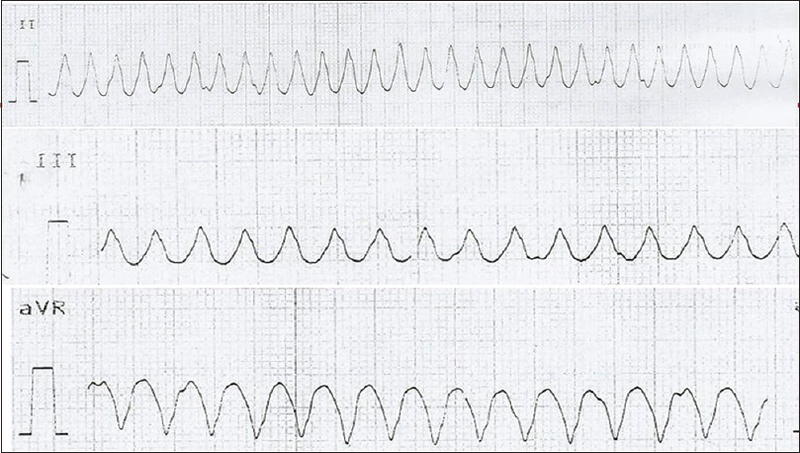 On follow after 12 months, the child continued to be asymptomatic with no fresh episode of palpitations. Repeat Holter study done showed normal sinus rhythm with heart rates around 80/min, but the child has no significant improvement in LV function. The child had sudden cardiac arrest 16 months after therapy while at home. Isolated tuberculous myocarditis is an extremely rare disease. Maurocadat reported the first such case in 1664 and the second case was reported in 1761 by Morgagni. About 1% of all cases of tuberculosis have supposedly cardiac involvement.,, Cardiac tuberculosis is essentially a disease of the pericardium. Endocardial, myocardial, valvular, or coronary arterial involvement is exceedingly rare. There are various postulates for tuberculosis having more affinity for the pericardium than the myocardium: (1) constant movement of the myocardium is not conducive to lodgment of tubercle bacilli and (2) Raviart proposed that lactic acid produced by muscular activity offers protection to cardiac muscle against the tubercle bacilli. The right side of the heart, particularly the right atrium, is particularly susceptible to disease spread owing to the potential for direct spread. Tubercular myocarditis usually results from direct extension from pericardium, hematogenous route, or retrograde lymphatic spread from bronchial lymph nodes due to endobronchial tuberculosis. Three different types of tubercular myocarditis have been reported: (a) diffuse infiltrative, (b) miliary, and (c) nodular with central caseation – known as a tuberculoma. Tubercular myocarditis can remain clinically asymptomatic (with a diagnosis being made at autopsy) or can present with sudden cardiac death, intractable ventricular arrhythmias, long QT syndrome, heart block, or congestive heart failure. Sudden cardiac death related to tuberculosis is also being reported. Cardiac complications, such as ventricular tachyarrhythmias, are rarer still but are potentially treatable, and prompt recognition of the underlying cause is crucial in these cases.,,,,,, On literature review, we observed that nodular variant as was present in our case is more commonly observed to be associated with rhythm disturbances or sudden cardiac death. Our case represented a well-preserved child with Bacillus Calmette–Guérin vaccine scar. 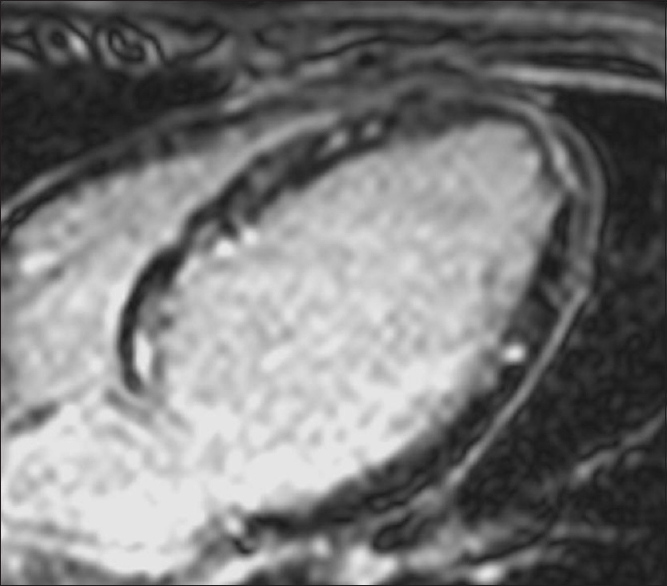 His MRI was suggestive of the presence of nodularity and he also presented with VT. There is always a close differential diagnosis of sarcoidosis, and hence, the child was also investigated for the same. Ventricular dysfunction is essentially because of tuberculous involvement as rhythm disturbances were not sustained enough to compromise the cardiac function. Cardiac dysfunction seems to persist a year later too, thus supporting the fact that rhythm disturbance was not the cause for it although we presume the sudden cardiac arrest may have been essentially because of arrhythmias. The nodularity of the myocardium and dysfunction in itself together form a substrate which makes the myocardium susceptible to ventricular arrhythmia. The literature on antemortem cases of myocardial tuberculosis is limited, and treatment largely follows empirical guidance. The index of suspicion for making this diagnosis should be raised if the arrhythmias prove refractory to the additive effects of multiple antiarrhythmic drugs. Antitubercular therapy forms the modality of therapy although a rare case of cardiac transplantation has also been reported. The ideal duration of therapy is also currently unclear, although one previous report documented successful resolution of VT following a year of antitubercular and antiarrhythmic therapy. Unfortunately, our case also had a fatal outcome and probably had a fatal episode of ventricular arrhythmia. Probably, these patients need to be under a very close follow-up and need a prolonged antiarrhythmic therapy. Tubercular myocarditis is a rare condition that should be suspected in patients with arrhythmias who could have been exposed to tuberculosis. It is important that awareness of this condition remains high so that a prompt diagnosis can be made although prognosis remains poor. Chan AC, Dickens P. Tuberculous myocarditis presenting as sudden cardiac death. Forensic Sci Int 1992;57:45-50. Khurana R, Shalhoub J, Verma A, Assomull R, Prasad SK, Kooner JS, et al. Tubercular myocarditis presenting with ventricular tachycardia. Nat Clin Pract Cardiovasc Med 2008;5:169-74. Gautam MP, Sogunuru G, Subramanyam G, Vishwanath RC. Tuberculous myocarditis presenting as a refrectory ventricular tachycardia of biventricular origin. J Coll Med Sci Nepal 2011;7:60-6. Agarwal R, Malhotra P, Awasthi A, Kakkar N, Gupta D. Tuberculous dilated cardiomyopathy: An under-recognized entity? BMC Infect Dis 2005;5:29. Silingardi E, Rivasi F, Santunione AL, Garagnani L. Sudden death from tubercular myocarditis. J Forensic Sci 2006;51:667-9. Dada MA, Lazarus NG, Kharsany AB, Sturm AW. Sudden death caused by myocardial tuberculosis: Case report and review of the literature. Am J Forensic Med Pathol 2000;21:385-8. Díaz-Peromingo JA, Mariño-Callejo AI, González-González C, García-Rodríguez JF, Ameneiros-Lago ME, Sesma-Sánchez P, et al. Tuberculous myocarditis presenting as long QT syndrome. Eur J Intern Med 2000;11:340-2. Kinare SG, Deshmukh MM. Complete atrioventricular block due to myocardial tuberculosis. Report of a case. Arch Pathol 1969;88:684-7. López Gude MJ, Pérez de la Sota E, Cortina Romero JM, Delgado JF, Gómez Sánchez MA, Aguado JM, et al. An unusual indication for cardiac transplantation: Isolated myocardial tuberculosis. J Heart Lung Transplant 2006;25:128-30.